Why Won't my Fall Leaves Based Compost Get Hot in My Compost Tumbler? I can't get hot compost going in my Compost Tumbler! My base is shredded fall leaves (oak&maple). I picked them up in a vac/bagger, so they are well-shredded. I add kitchen waste (no animal materials) and coffee grounds (at least 5-10 pounds; I get the stuff from Starbucks in addition to our daily pot). Ratio of leaves to other stuff is maybe 5:1. I add water (compost tea) and it is damp but I cant really wring much out of a handful. I spin every day (mostly). No ammonia smell or slime - this is a "too slow" problem. Problem - it barely gets warm! I have that long thermometer and I am lucky to get to 110 degrees after 3-4 days. And you can forget a batch every 2 weeks like the Tumbler people say - maybe 3 batches a summer? I add a little blood meal but it is too expensive to add more than a cup. In desperation, I have also tried a couple cups of urea (the powder, not using a euphemism for urine) as an N source- this helps little but still only gets me to 130 degrees and doesn't seem to speed things up much. I live in in the burbs and don't have a manure source, or a pickup truck to go get it. Any thoughts on why I can't get a hotter/faster batch going?? Steve thank you very much for your question. I bet lots of people end up having similar problems to the one you've described. You shredded the leaves before using them. This is essential. When things went too slow you added nitrogen - both blood meal and urea. Given low nitrogen is an important part of the problem this was worth trying. You've got three problems here - the initial mix, the challenges with the types of leaves and the need for fungi. greens. Your starting mix was 5 parts browns to 1 part greens. This is way too high in the browns. It should be more like 2 parts browns to 1 part greens. Leaves have their own challenges in composting. I have a whole page about composting leaves you may want to check out. Leaves have varying amounts of lignin as well as waxes in them. This stuff is tough to break down. The maple leaves are relatively low in lignin and a bit higher in nitrogen and calcium so under normal conditions would break down in about a year. The oak leaves are way tougher with much higher levels of waxes and lignin. They can take two or more years to fully break down. Fungi are the organisms equipped to breakdown the lignin in leaves. They extend their hyphae - thread like strands that function somewhat like roots - through the material they are breaking down. They thrive in cooler temperatures and don't really get started until after the heat loving bacteria have had their way. So, for what you now need to decompose cooler temperatures are best. As well fungi work best if their hyphae can develop undisturbed. Every time you turn the tumbler you are probably breaking up all those hyphae forcing them to more or less start over. Empty your tumbler. You'll probably find that most of the greens you added have broken down and it's just the fall leaves that are still intact. I would use this material as it is. Just apply it as a mulch to the top of your soil. The leaves will breakdown slowly over time and the nutrients from them will be drawn down into the soil by earthworms. A second option would be just to pile it up and let it sit for a year or so. 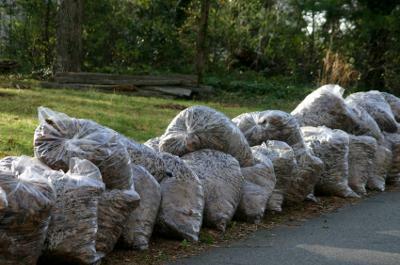 At that time it would qualify as leaf mold and would be once again a welcome addition to your garden. Use as mulch. You can still use shredded leaves in the tumbler but as a much smaller ratio. Or substitute shredded paper. Thanks again for your question Steve. Good composting, and gardening.